A work of this scale doesn’t happen overnight. So, from the composer’s eye view, let’s go back more than two years, shall we? 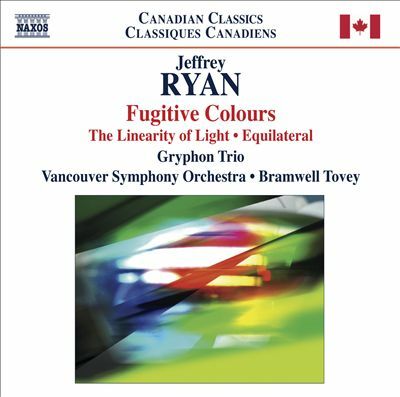 In late 2016, I got a call from Roman Borys, cellist of the Gryphon Trio, to talk about the possibility of my writing a big piece for the trio’s 25th anniversary season. I’ve known Annalee, Roman and Jamie for many years. I think we first met through Music TORONTO, where I am Composer Advisor and they were (long ago) Ensemble-in-Residence. 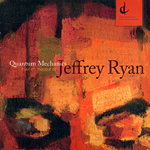 Since then, they’ve appeared on my chamber CD Quantum Mechanics, I wrote my triple concerto Equilateral for them and the Vancouver Symphony (on Fugitive Colours), and I’ve worked with them on a couple of their Listen Up! projects. 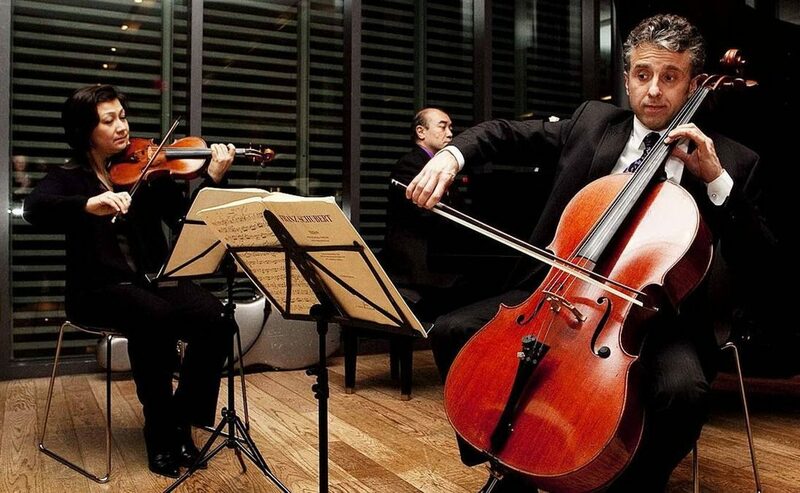 They are fantastic musicians and adventurous performers. For this new project, they were interested in combining the Trio with a small vocal group—they had already been part of new works with vocal soloists and with chamber choir, so this would be something in between, that would have the intimacy of individual voices but also a vocal ensemble sound. And they were interested in commissioning new poetry as well. I love working with the Gryphons and I love writing for voices and I love working with writers. Roman may have actually formally asked “Is this something you’d be interested in doing?” but there is only one answer to that question because what am I, an idiot? A project like this is a dream come true! There was interest from an American commissioning consortium, the Sounds of Science Commissioning Club, to be a supporter of the project. SoSCC’s raison d’être is to support new music creations that are inspired in some way by science. A lot of my music is inspired by science and nature anyway, so that sounded like a good partnership. We just had to find the perfect inspiration. And the perfect vocal ensemble. Roman and I brainstormed a list of vocal ensembles, each quite distinct from the others. I honestly don’t remember how I first heard of Nordic Voices, but the more I learned about them, the more solidly they were at the top of my list. 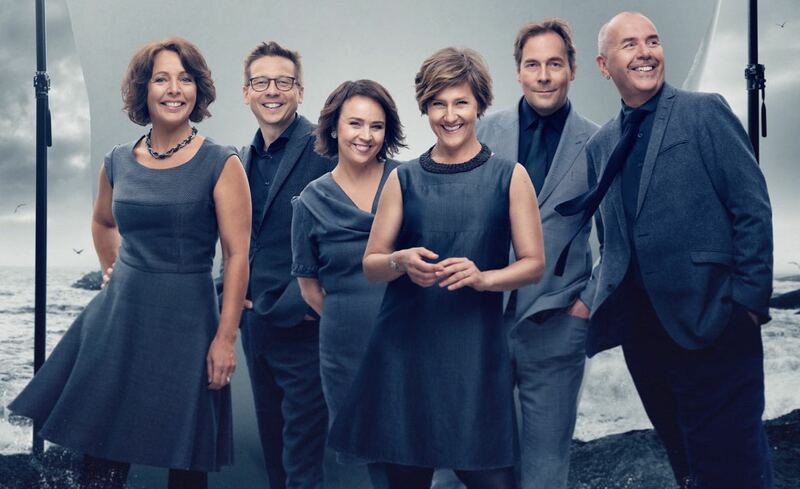 Nordic Voices is a six-member ensemble based in Oslo, Norway. Three women, three men, offering the highest high notes and the lowest low. They tour extensively, sing lots of new music and commission a lot of it as well. I could just picture them as part of this. 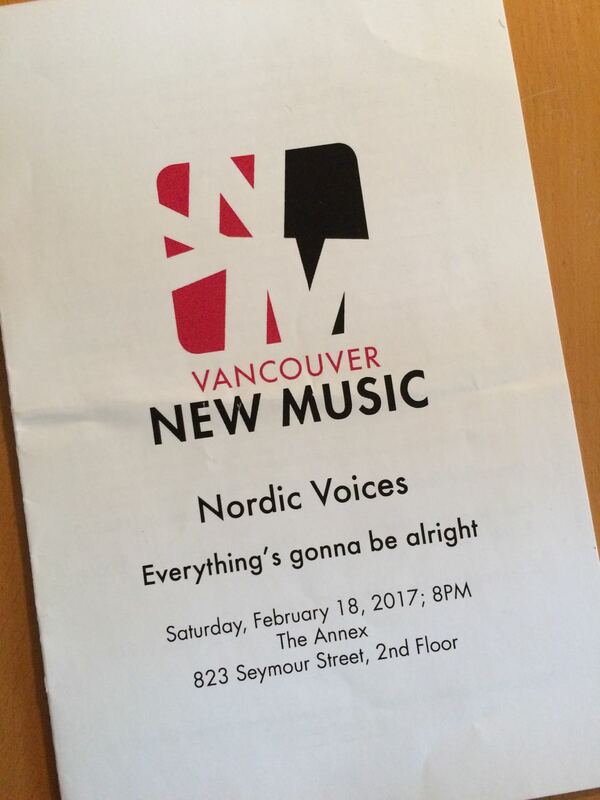 Then I learned that, in a very convenient bit of synchronicity, mere weeks later Nordic Voices would be in Vancouver to perform an all-contemporary concert for Vancouver New Music. A perfect opportunity for reconnaissance! Well, they were phenomenal. And afterwards, in the lobby, I bought some CDs (for more recon) and introduced myself to each of them, told them a bit about our nascent project and asked whether they’d be interested in talking more about it and whom should we contact? As we chatted, I kept thinking “These are the nicest people, please please please let this work out!” And it did. I suppose the Gryphons’ people talked with Nordic’s people, however that goes, but eventually everyone was on board and the picture that I would keep in my head while I’m composing was complete. Of course, there was still the question of the subject. Oh yeah, and the words! But those are topics for the next post.